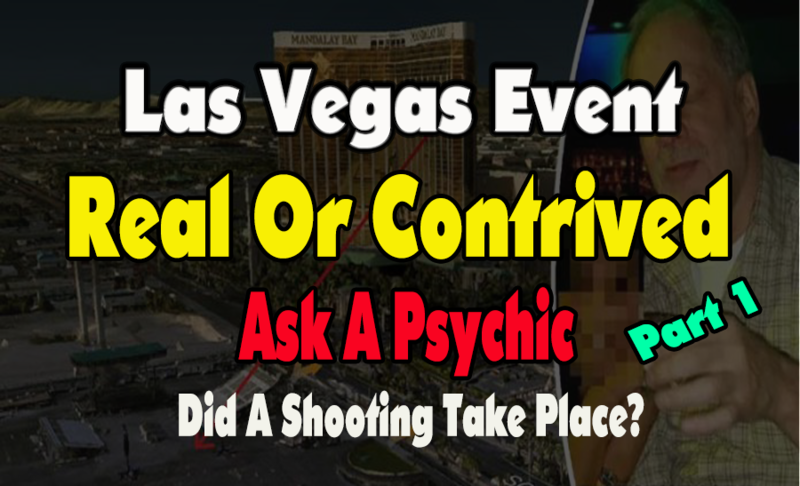 This video is Part 1 in our series, Las Vegas: Real or Contrived? Ask a Psychic. In this video we will look at the readings from the I Ching as it relates to whether or not there was actually a shooting. Did it take place? Was this event the result of one shooter or multiple shooters? To be honest, I have no real experience with a firearm, nor have I ever been shot at or in close proximity to anyone who was shot. However, I am aware of folks who have been shot by guns with less fire power than was reported in this event, and to this day they are still in recovery. But again, I have no clue what an open battle field looks like and for sure, with all the Hollyweird goings on and filtering of reports from the real live battlefields that are happening right now, I am left with little knowledge about what that would even look like. However, judging from the audio.. It appears that something was going on that was not being explained clearly and succinctly to even a novice like myself. So, Like I always say, I prefer to ask the Oracle and see what I receive from them. The Oracle can help me look behind the veil of illusion, mine and what the MSM’s narrative is. So let’s look at what the I Ching is telling us as it relates to whether or not a shooting took place and if so, was there only one shooter or multiple shooters. As I mentioned in my previous video, I will also sight the readings I received when consulting about the energetic forces. The idea here is to correlated and see if there are connections between the energetic forces and the topic of each part in the series. I have found that these connections help us to better understand how the Oracle attributes the influences between the different actors and/or situations. Support My Work, it would be greatly appreciated. YouTube is doing its level best to make it hard for content creators. Available for Psychic Readings, Dream Interpretation and Workshops. How Billions were * FOOLED * by the Vegas shooting (Part 2) because I like to share the video I am commenting on, just like I do with articles, etc. But when I found my comment, and clicked on the link, well it seems, this channel has been terminated. So I searched the title of the video and found the video, but I downloaded it just in case it disappears again. The owner of this YouTube Channel started another one that is now called Nevada Forensics. So let me move on to my comment. Divide and Conquer strategies are working over time with this situation. Hi @Nevada Forensics LLC, yeah, is that really your true name?? Anyways, I like that angle you showed about the “Parkers”. They do that a lot. Paddock = field Campos = Field Steve Stephens killed and old man Stephen Paddock is an old man, Jesus Campos saved people, Jesus Christ is a savior. And on and on. These connections however do not make the entire event a hoax. But what it does do is polarize the truth community. It creates division and that is the ultimate goal to divide the people and have them fighting among themselves. Just because the Media has not released any footage or pictures of the dead or wounded does not mean there were none. False Flags does not mean nobody died. It has a purpose and one of them is to galvanize the masses into sparring corners, while the real things that we need to be addressing go unattended to. Like, WHERE ARE THE EVACUEES FROM THE HURRICANES AND FIRES!! We will sit in front of our computers dissecting “released” footage of Crisis actors who are so ridiculous it ain’t funny, but they are supposed to be ridiculous, they are mocking us and getting a big kick out of muddying the waters so we don’t know which way is up. It’s sort of the whole thing about there being “NO PLANES” and ignoring the masterminds behind the plot and how come the towers turned to dust. This event is moving us into the same Twilight Zone that the whole Pizzagate has done. Then the PTB retaliate by shutting down more and more channels, censoring more and more YouTube content, perpetrating economic warfare on the YouTube Creators who have worked for years building an audience and turning this platform into a full time job, discouraging folks from producing more content, harassing folks to pay for something they got for free, and on and on. They knew they could not shut the Internet down directly but one of the agendas that come out of this “Nobody Died Narrative” is that they will have ample reason to shut us down, one by one, till they have wiped clean the entire YouTube platform in favor of the Real Fake News. I suggest we assume that this event was real and staged at the same time. That unless we were there and have actual proof that no one died, that we do like they do and say all of the above. Remember, the masterminds of these events try to cover all the bases as they are aware that everything moves in a circular fashion, which is why the names repeat themselves. Those are the winks they give to each other. So we have to broaden our vision as well and do our level best to encompass the many possible scenarios, instead of narrowing it down to just one. WTH!?! Video of Stephen Paddock Alive AFTER Las Vegas Shooting??? It’s like 911.. the most heavily secured airspace, and yoko locals manage to overtake four planes and pilots with box cutters. It makes no sense that more security, more police, more surveillance and less guns are going to prevent this from happening when it has done absolutely nothing to stop this from happening in the first place. to me, it shows that the Intelligence Operation in this country is not so intelligent after all, or maybe they know more than they are letting on. Las Vegas mass shooting: more than one shooter? False flag in Vegas shooting? WHY ISN’T THE MEDIA SHOWING PICTURES OF THE GUNS? Who is Marilou Danley, girlfriend of suspected Las Vegas shooter Stephen Paddock? Truthstream Media does excellent research! 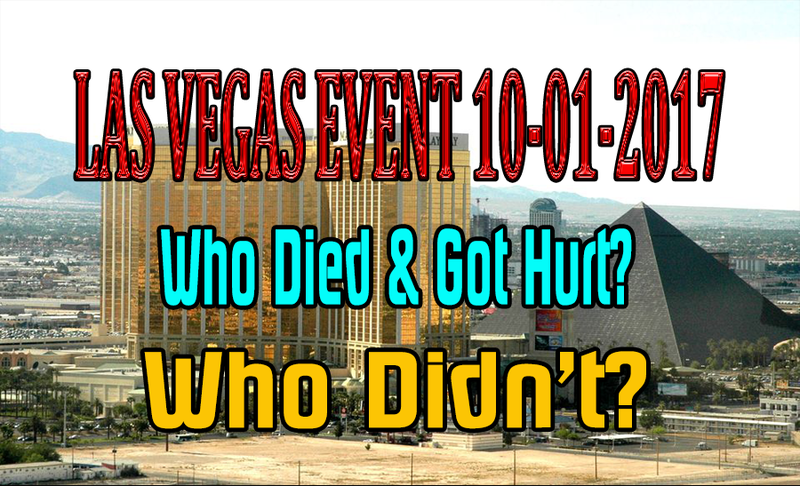 Eerie Predictions in Vegas… Cui Bono?